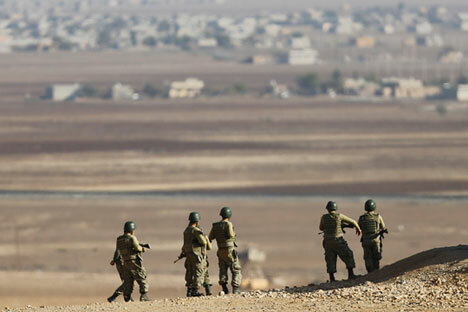 Turkish soldiers watch fighting between Kurdish fighters and Islamic State militants from atop a hill overlooking the Syrian town of Kobani, near the Mursitpinar border crossing on the Turkish-Syrian border in Sanliurfa province November 10, 2014. According to Alexander Vasilyev, a Russian expert on Turkey, while there is no current danger of a full-blown military conflict breaking out between Ankara and Moscow, Turkey is keen to develop a truly independent foreign policy and has ambitions to become a modern nuclear power in order to make this a reality. Turkey has been consistently building up its military presence near the border with Syria for a long time now, bringing in heavy weapons and artillery into the area. It is clear that a war between Russia and Turkey is so far out of the question, but incidents and clashes in Syria (the country that Ankara sees as its sphere of interest) with the participation of the military of both countries are now quite possible. How does this threaten Russia? What is the condition of the Turkish army now? How does it see the future of Turkey? Alexander Vasilyev, a researcher of the Institute of Oriental Studies at the Russian Academy of Sciences and the Russian State Humanitarian University's Russian-Turkish Educational and Scientific Center, spoke about this in an interview. Is the Turkish army any different from the other allied NATO armies, in principle? Alexander Vasilyev: Maybe it is not such a hi-tech army as the U.S. army, but it is very numerous, and well-armed. Two things set it apart from the armies of the Europeans and Americans – the willingness to bear the great cost in human lives and the willingness to fight in extremely uncomfortable, harsh conditions. The most psychologically motivated are the commandos and officers. The army is recruited by conscription, and is made up mostly of conscripts. But intensive propaganda work is carried out at the barracks. If you look at the biographies of the last chiefs of staff, you will see that they speak two or even three Western languages, and studied for many years not only in Turkey but also in Western Europe, in NATO structures worldwide. They have great political, administrative and sometimes diplomatic experience. The army command consists of educated and yet decisive people. The main ideology is, of course, nationalism, but it often grows into ultra-right views. But how high is Erdogan's credibility among the generals now? It is common knowledge that at the beginning of his rule, he was faced with constant unvoiced resistance from the military. A.V. : The attitude toward him has been changing. Some of the General Staff were going to intervene in politics, but the moment turned out to be inopportune. Erdogan used the criteria for entry put forward by the European Union to break the military, to subordinate them to his will. In the end, a civilian specialist has been appointed as the defense minister, while economic matters have been withdrawn from the competence of the General Staff and transferred to the Defense Ministry. However, the annual meeting of the Supreme Military Council of Turkey was held in late August of this year, shortly before some of those arrested on charges of plotting a coup were unexpectedly released from prison. Many "hawks" have been rehabilitated and returned to their seats. Moreover, some of them have even been promoted in rank. All this was indicative of the fact that Erdogan agreed, on the whole, with the military. Were the generals pleased by the downing of the Russian aircraft? A.V. : The generals have long proposed pursuing a more active foreign policy. It is possible that they would like not to limit themselves to the destruction of one Russian plane, but to prepare for an open annexation of the Turkmen regions of Syria. Recently, the Turkish authorities have been very actively developing the idea in the media that the borders at the end of World War I, specifically the border with Syria, were drawn unfairly and divided the Turkish people. It is worrying that troops on the border with these Turkmen areas are continuing to build up. Tanks and howitzer artillery are being brought in into the area. Against the backdrop of Erdogan's unpredictability, we may expect a ground operation in Syria. But such a step as the accession of a part of Syria will invite outright rejection from the allies, won't it? Countries with disputed borders cannot be NATO members. A.V. : After a recent visit to Turkey, I got the impression that many of the military had grown disappointed with international security structures. Their agenda now is to search for technologies that could provide Ankara with missiles and nuclear weapons. In the future, once this goal is achieved, it is possible that Turkey will leave NATO altogether. I have seen points in the reports of Turkish military experts that only the possession of nuclear weapons will help Turkey to fully pursue an independent foreign policy. Of course, the nuclear program is still at an early stage there. In addition to the construction of our Akkuyu nuclear power plant in the south, the construction of a Japanese nuclear power plant in Sinop, on the Black Sea, has already begun. As far as I know, until recently, personnel for the Turkish nuclear energy industry had been widely and actively trained at our MEPhI [the National Research Nuclear University – Vzglyad]. Moreover, Turkey has recently made progress in creating missile weapons – primarily with the help of technologies that were passed by the Europeans and Americans, as well as by purchasing ready-made missiles in China. In particular, Turkey already has operational-tactical missiles, a clone of the Chinese system with a range of about 300 kilometers. The last IDEF-2015 defense exhibition in Istanbul showed fairly big successes by the Turks in rocket building.